This is our first rental season of our cabin. My name is Tony (818*681*8049) please feel free to call or text me with any questions you may have.) I would like to welcome you to the beautiful and amazing fresh air of the Sierra National forest amongst 100 and 200 foot cedar and pine trees in this almost 1800 Sq. Foot, 2 story chalet style cabin. It is located in the amazing and serene community of the historic Madera Sugar Pine Lumber Company, which was the largest, most successful lumber operation in the west. Sugar pine is just below Fish Camp on the way to Yosemite just minutes from the park entrance. This beautiful 2 story chalet style cabin sits high amongst the tall majestic Pine, Cedar and Fir trees. Open the back door and step out into the forest, a comfortable seating area, and gas fire pit provide the perfect ambience for a dinner on the front deck or just to relax among the tall trees and enjoy the peace, quiet and forest scents. The cabin is located 8 miles north of Oakhurst off of highway 41, just 7 miles from the southern entrance of Yosemite National Park and 20 minutes to Bass Lake. The upstairs master bedroom and a loft has views of the pines, and has a private 3/4 bath and a wall mounted t.v. A childs room with a twin bed shares the upper floor. The main floor offers a fully stocked kitchen with dinnerware, appliances, and all the amenities needed. The second bedroom with a 50 inch wall mounted TV, the second bathroom and the great room. The dining area has a table for 6, breakfast bar for 3 and wood burning fireplace. The living room has 2 large futons plus one additional separate recliner, and a 75 inch television. The bathroom with with walk in shower and full indoor laundry room is also a few step away from the dining area. All TVs offer Dish TV with all the movie, sports and on demand channels, Wifi, and wifi calling are included, and local calls. Old historic Lewis Creek runs nearby, and the entrance to the famous Lewis Creek hike is just below the cabin on Road 630. The Lewis Creek hike boasts 2 very unique waterfalls, Red Rock and Corilieu Falls. Oringally, this creek was used to provide water to the 56 mile flume that took the cut lumber down to Madera during the production years of the lumbar company (1898-1931). The property is only 1 mile off highway 41. The owners have pets but a deep cleaning is performed prior to renting and no pets are allowed during the entire rental season to ensure a clean and allergy free environment. NO PETS Allowed. Our cabin is amazing and was built in 1999 so it is very up to date. We take great pride offering the best we can do for our guests. toilet, tub, Tub has a hand held shower sprayer. toilet, combination tub/shower, Main floor bathroom. Air Conditioning is not needed in our area because of the high elevation of 4300 feet and the shade of the 150 foot trees. summer nights are cool and the house is always in the shade. Central heating In the forest at this high elevation it stays cool and Air conditioning is not generly needed in our area. Wood Burning Floor to ceiling rock fireplace with wood stove type door. We provide all the wood you will need located under the deck. Dining Table seats 6. Breakfast bar seats 3. Front deck off the main living area with comfortable patio furniture and a propane FIRE PIT for peaceful evening chill time. :) you will have a tree house feel as you enjoy the pine and cedar trees. A wonderful cozy mountain chalet! Clean, cozy and comfortable! This place was exactly what my family and I were looking for! We needed enough space for two adult couples to have comfort and privacy for sleeping/bathroom needs, and we also wanted room to cook, relax, play games and just enjoy the beauty of the surroundings. The big beautiful windows framing the view outside, the deck with a gas firepit, the charming decor (including beautiful antiques! ), plentiful bathroom amenities, so many little details that we were delighted to discover--- and everything so CLEAN and FRESH! Sara and Tony have obviously spent a lot of time and energy to make this a comfortable retreat for folks who want to spend time in nature. The proximity to Yosemite (7 mi from the South Entrance) and to commercial comforts (8 mi to Oakhurst) was perfect for us, and the Lewis Creek trails nearby were just the thing for our first day in the area--- beautiful falls, nicely maintained trails! I am really picky about the cleanliness and the aesthetics of the places we rent, and this house did not disappoint in any way! I would definitely stay here again if we were to return to the area. Thanks, Sara and Tony, for sharing your lovely home with us! Great cabin. Very clean and bright. Good location near the South entrance tobYosemite National Park. Sara and Doug were super quick to respond to our phone calls. We were very satisfied with the overall experience. One possible improvement would be to have the heat controlled remotely so the cabin could be warm upon arrival if necessary. I really enjoyed time at the sugar pine cabin. Gracious hosts, beautiful setting. Wonderful! A wonderful cabin in a sweet canyon community. Excellent hosts! The area was so beautiful, matched exactly as detailed. Tony was amazing and gave me a call to give me a run down of their home, the area, and activities to do. Their home is beyond beautiful, close to Yosemite. Would give this place a 12 out of 10! Thank you both for a wonderful experience. We loved staying at the Sugar Pine cabin. The cabin was very spacious and clean. The great room featured a beautiful two story stone fireplace, with logs ready for a fire. The kitchen had everything needed if you wanted to cook. There were lots of little details that the owners thought of such as first aid kits, band aids, hair dryer, curling iron, information about local activities and hikes. They even had a washer and dryer, which was great after some long dirty hikes. 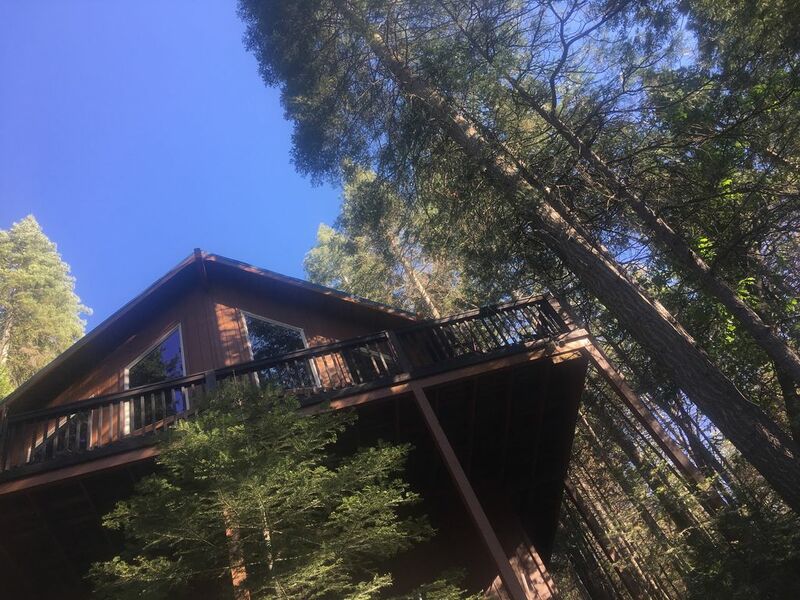 My husband and I stayed at the cabin, but with all the room it would be great for a family.The cabin was convenient to Oakhurst and Yosemite. Yosemite was easy to access from the cabin. Just a short drive to the main gates. This is a cabin I would rent again if I were in the area! Great location, very quite and clean. Rates subject to change with out notice prior to booking.